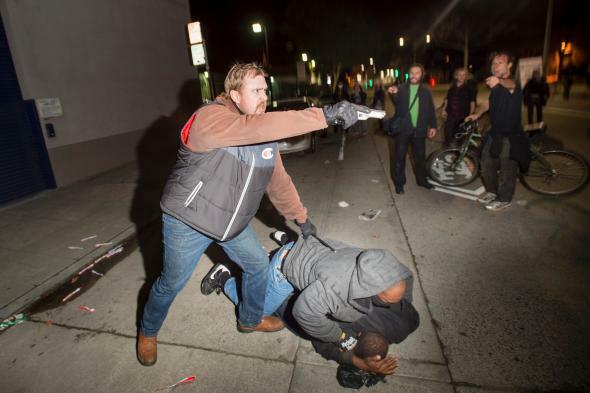 Undercover cop pulls gun on protesters at Oakland demonstration. A plain clothes California Highway Patrol detectiv aims his gun at protester. Protests over police brutality have roiled the Bay Area for days. Earlier this week, police fired rubber bullets at demonstrators and made dozens of arrests. On Wednesday, two California Highway Patrol officers went undercover at an Oakland demonstration, marching with protesters, presumably to monitor the crowd. If their intention was to keep the peace, it didn’t work. The officers were identified as undercover cops by protesters. An altercation began and then ended when one of the undercover officers pulled out a gun and pointed it at protesters. Short said the undercover officers were wearing street clothes and had their faces covered. After the shorter officer tackled the person who attacked him, he pulled out a set of handcuffs. The taller man then radioed for help, Short said. Prior to the encounter, vandals marching with the group had smashed the windows of a T-Mobile store in Oakland’s Chinatown neighborhood and made off with some of the store’s merchandise, Short said. A nearby Wells Fargo ATM was also smashed.